The first chapel of Alameda was constructed in 1734 under the patronage of Nuestra Senora de la Concepcion at the request of the Alcalde Mayor Juan Gonzales Baz. 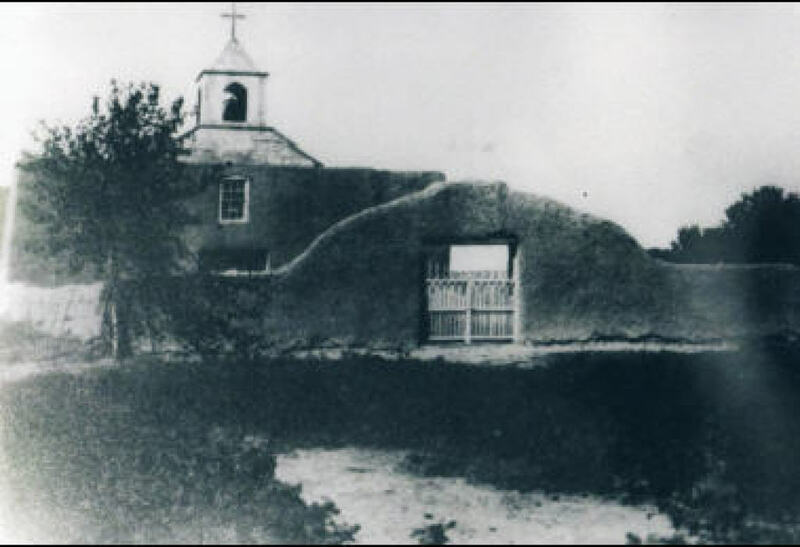 Eighteen vigas which were originally intended for the church of Santa Ana Pueblo were used to support the roof of this chapel. Fray Francisco Atanasio Dominguez visited this chapel in 1776. In 1829 the chapel was replaced by a larger church. It was named La Natividad de Maria Santisima and the location was north from the corner of Alameda Blvd. and N. Rio Grande Blvd. Fr. 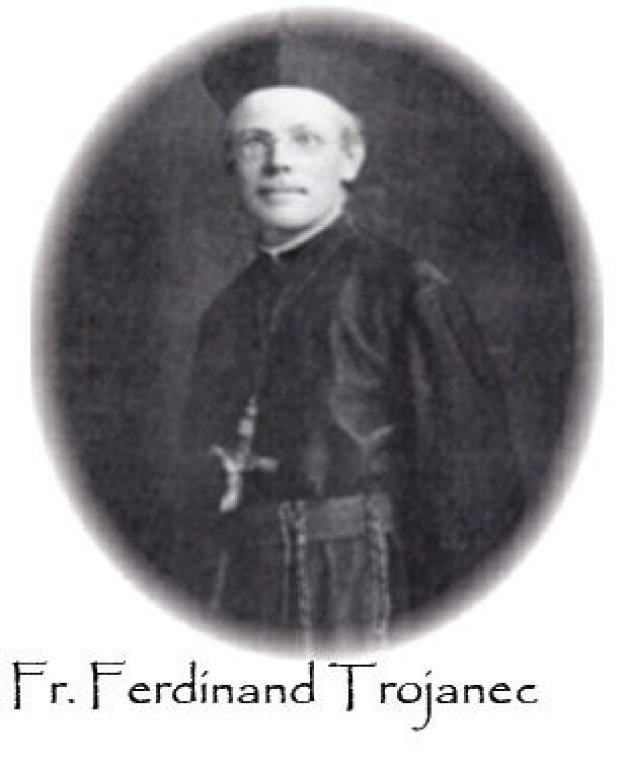 Ferdinand Trojanec, S.J. (Troy) supervised the construction of the third church. The cornerstone was laid on Monday, March 4th, 1907. The first Mass was celebrated in the unfinished church by Fr. Troy on Friday, September 8th, 1911, Feast of the Nativity of Our Lady. The church was consecrated by Archbishop Juan Bautista Pitival on Sunday, November 16th, 1913. Fr. Troy lived at San Felipe rectory and ministered to the community of Alameda until his death of December 23rd, 1936. He was hit by a drunk driver as he crossed 4th St. in front of the church. His funeral mass was held at Nativity Church on December 24th, 1936. He is buried at Mt. Calvary Cemetery. The foundations of the church were constructed of granite stone. The walls are of sandstone held together with lime base grout. All the stone was quarried in the foothills of the Sandia Mountains and hauled in wagons by local residents. The original roof, still in place under the present blue roof, is Queen Ann style of beige metal shingles. It is believed that Fr. Troy installed the original crosses above the towers. The floor of the nave is made of one by six tongue and groove pine. The large beams supporting it are believed to be from the original ceiling of the 1829 church. Tin panels covered the vaulted ceiling. 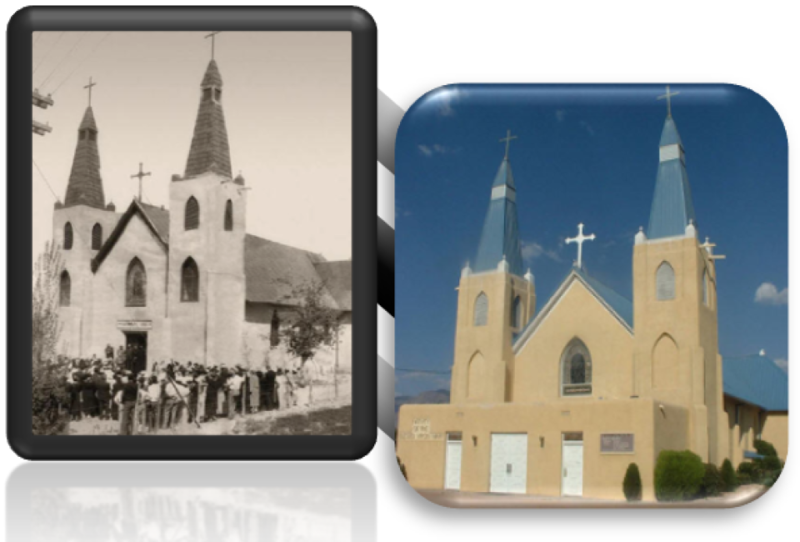 The two round stained glass windows of the sanctuary and the gothic window of the choir loft are original to the church and the oldest of any Catholic Church in Albuquerque. The original gothic altar was made of wood, painted white, blue and gold. It measured 21ft high by 16ft wide and 6 ft in depth. Two plain side altars adorned the transepts. One of them contained the image of Christ's corpus visible through a glass door. The church was heated by a wood and coal furnace located in the small basement. There was no air conditioning. During the summer months the large side windows made of wood and white frosted glass in the nave and transepts were opened for ventilation. Two bells which were cast in New York in 1892 are located within the south tower. During the nineteen twenties a set of rooms was added to the rear of the church to be used as office and living space for the priest. In 1956 the church went through extensive renovation. The inside walls were covered with wood panels and the tin ceiling with acoustical tile. The floors were carpeted. A vestibule was added. Most of the original statues, the side altars and the main altar were removed and new ones purchased. The round stained glass windows were given away. The windows of the nave and transepts were replaced with stained glass windows. New light fixtures were installed. The windows in the towers were removed and covered over with sheet rock and plaster. The outside color became yellow. In 1994 the church was once again remodeled. The walls and original ceiling were plastered over. Fluorescent lights were installed. The transepts were elevated to the level of the sanctuary. The plastic back altar was replaced with a section of a gothic altar brought from a chapel in Colorado. New pews, carpet, and six new stained glass windows were installed. Restrooms were added to the vestibule. New heating and air conditioning systems were installed. 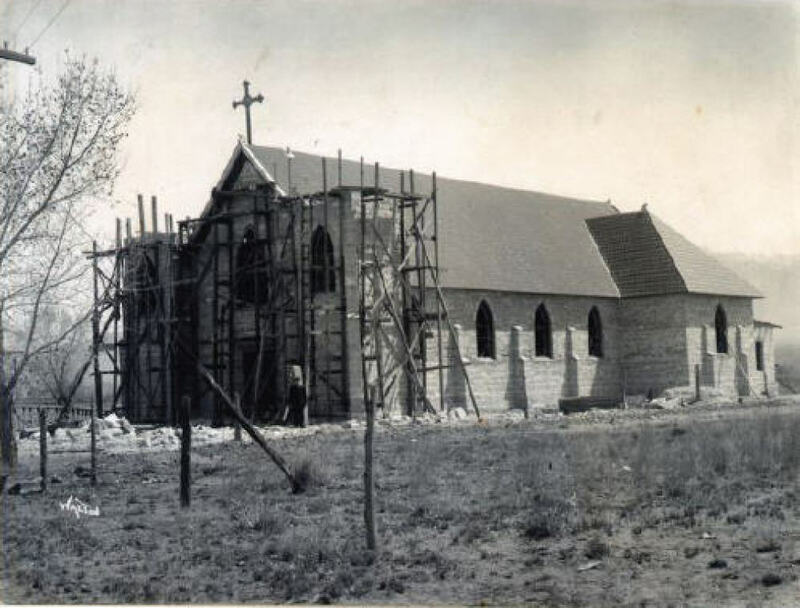 In preparation for the centennial of the laying of the cornerstone the church has once again been undergoing major restoration. 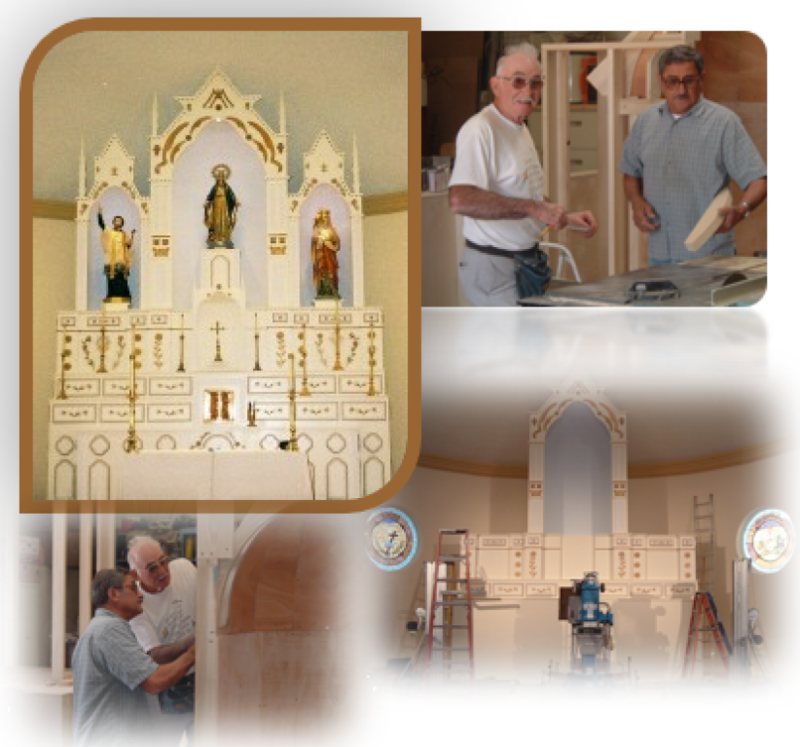 A replica of the original main altar was fabricated by the following parishioners; Bobbie Connick, Patrick Hammond, Henry Sanchez and Orlando Saiz. They are now working on a matching altar of celebration and ambo. The wooden sanctuary floor was restored. Replicas of the original front doors were fabricated. Gothic style light fixtures replaced the recessed florescent light. Several statues that were returned to the church have been restored and now grace our church once again. The original round stained glass windows and the gothic choir loft window have been re-leaded and repaired. The original Holy Water silver bucket and Fr. Troy's chalice are now used for liturgical functions. The vestibule has been removed making the original facade visible. A new ramp replacing the original front steps has been added and new restrooms are now located in the rear of the church. The parking lot has been expanded with plenty of handicap spaces. Replicas of the two tower windows have been built and are in place. The entire church has been given a coat of the original color of stucco.